Provide comfort for the family of Oleta Moler with a meaningful gesture of sympathy. Oleta Fern Moler, 83, of Stillwater, Oklahoma passed away April 14, 2019 with her children by her side at Willow Creek in Guthrie, Oklahoma. Her life and faith will be celebrated at St. Francis Xavier Catholic Church, Stillwater, Oklahoma, with a Rosary service on Tuesday, April 16 at 7pm, and a funeral mass on Wednesday, April 17 at 11am, followed by interment at St. Mary’s Cemetery in Ponca City, Oklahoma. 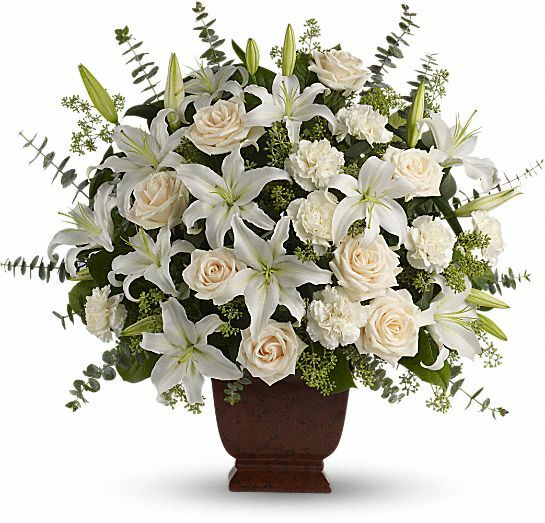 Strode Funeral Home and Cremation is in charge of the arrangements. Oleta was born to the late Melda and Raymond L. Babcock, April 27, 1935, in Mutual, Oklahoma. Early in childhood, Oleta’s family moved to Alva, Oklahoma, where she attended grammar school and then later moved to Ponca City where she graduated high school. She married the late William J. Moler, May 15, 1954, in Culver City, California before returning to Oklahoma later that year to raise their family. Oleta is survived by five children: Catherine Asmussen (Mark) of West Monroe, LA, Theresa Abernathy (David) of St. Louis, Roberta Moler-Mitchell of Stillwater, Robert Moler (Nicole) of Dallas, and William R. Moler (Amy) of Kansas City, along with 18 grandchildren and 15 great-grandchildren. Oleta was predeceased by her loving husband of 64 years in July of 2018. Memorials in lieu of flowers may be made to the Mother Teresa Ministry at St. Francis Xavier church in Stillwater, Oklahoma. 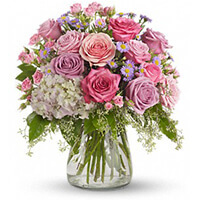 To send flowers in memory of Oleta Fern Moler, please visit our Heartfelt Sympathies Store. We encourage you to share your most beloved memories of Oleta here, so that the family and other loved ones can always see it. You can upload cherished photographs, or share your favorite stories, and can even comment on those shared by others. Jeff Nelson and Family, Joe Lamberti and the Merrill Lynch Team, and others have sent flowers to the family of Oleta Fern Moler. Jeff Nelson and Family purchased flowers for the family of Oleta Moler. Moler family: Jim (Arnold) and I (Shirley Arnold) met your parents before Billy and Bobby were born. Jim worked with Bill for many, many years for OG&E. They were funny together. Bill supported OU. Jim supported OSU. Bill was Catholic. Jim was Baptist. During their funny conversations, Oleta would just bring in some cold drinks and cookies and smile at both men. Your Mom was such a delight and would help you any way she could. It was nice when I could return the favor. I remember sitting with Billy and Bobby in the hospital while Bill & Oleta's mom were in the same hospital. I thought that was really a tough time for Oleta, but she handled it with grace. Jim and Bill would help each other anytime they needed help, too, but never agreed on religion or the state universities! I can close my eyes and almost hear Oleta's calm and gentle voice. Bill and Oleta were SO proud of their children and grandchildren! God bless and guide their family in the future. Thank you so much you for your kind comments.. I remember fondly Mom & Dad's relationship with your family and other co-workers at OG&E. You will be humored to know that after many years of living in Stillwater, Dad finally accepted Orange Power! Mom was a rock and carried so many hardships with her health with steadfast grace. While we miss them both terribly, we are happy that they are together again and both are free from any the afflictions they suffered here on earth. 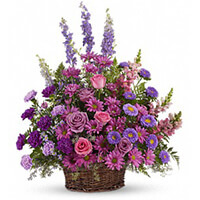 Joe Lamberti and the Merrill Lynch Team purchased the Gracious Lavender Basket for the family of Oleta Moler. Bill, please know you and your family have our sincerest sympathies. 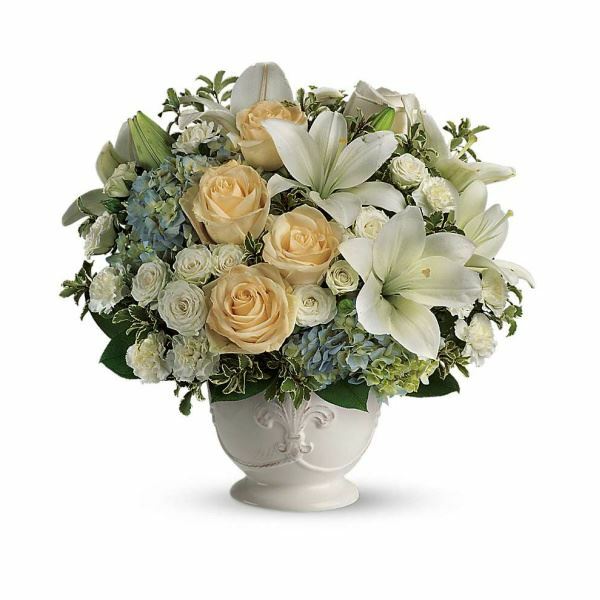 Heartfelt Sympathies Store purchased the Loving Lilies & Roses Bouquet for the family of Oleta Moler. Bob - Our thoughts and prayers are with you and your family during this time. Trina, Jeff, Kathleen, and the CE Team purchased the Your Light Shines for the family of Oleta Moler.